Top 5 Things that are KILLING your game. Part 4: Not digging the easy balls. Working with the future at Montessori in Manhattan Beach. After coaching thousands of beach volleyball players over the years I’ve recently noticed that I’ve been able to put a few pieces of advice on repeat. There are certain types of errors that run absolutely rampant throughout the amateur population. The interesting thing is that the same mistakes are being made from beginners all the way to AAA players. The difference maker between those groups is usually time and repetitions. At VolleyCamp Hermosa we run training camps and lessons for every level. We have even run trips to Gandia, Spain and are continuing to seek out new beaches. Book your volleyball training vacation here. Problem #4: Not digging the easy balls. Mistake: Too much defensive movement. Trying to read minds. Easy Fix: Get your feet in the sand get low and embrace the race. Too many intermediate players live in an imaginary world. In this world, their mystical clairvoyant powers allow them to dig every ball. They can read minds and see into the future. They KNOW that the hitter sees them and will try to hit the other way so they take that step to the high line just as their opponent hits AND… the cutty drops for another kill. Sorry Professor Xavier. You don’t see into people’s minds. Go back to your day job. These false moves can drive a coach insane and I know personally, I say it at just about every beach volleyball camp I coach. There is no physical evidence that the attacker is going one way or the other and yet Digger of the Year just KNOWS they are going high line. READING, for the best players in beach volleyball is not guessing. It means taking a series of physical cues and getting into a position that lets you get to an array of the highest probable shots. If you can’t describe the situation and the cues, then you aren’t reading properly. When an attacker is forced to hit from outside their body, this is a cue. If a right handed attacker is reaching right with a straight elbow, it’s going to be difficult for them to hit to their left side. If they are reaching right but still able to create a swing motion, it will be difficult for them NOT to bring it back to the left side. If they are reaching over their head to their left side, they have a high slow diggable high line available, or some cuts but nothing hard driven, the tendency is to hit back in the direction of their hitting arm side as show below. This cues give us the excuse we need to reposition ourselves as defenders. I want to emphasize the word ‘reposition’ because it doesn’t mean giving chase to a ball that hasn’t been hit yet. It means getting to a position so that you can easily dig the high probability shots but still have the balance and physical access to all areas of the court. If you play with a blocker, the defender should be shaded to the middle of the court until we KNOW that there is no ‘ON 2’ threat. Great defenders never sleep on the ‘ON 2’ ball. This shade should be one step closer to the middle than the defensive position you want to end up in. For example, the blocker is going to block line so you will end up playing defense in the diagonal. Your start position should be about one step from middle in the diagonal court. Then, when the setter sets, you can release to your position. Many pro’s take this one step further and slide into position just as the hitter jumps. If you don’t play with a blocker (like most juniors) you should do this in a similar fashion because one person should be designated to protect the over set. That ‘rover’ should follow the play the same way a blocker would but just be positioned 10 feet off the net. Oren is probably to far in the middle for a shade position but the timing is right, the set has been made and the defender is shifting to diagonal defense. Once you get into your defense position, FOCUS ONLY on perfect starts. Sprinters spend their entire careers training themselves to explode on the sound of that starting gun. Defenders should spend their careers training to react to the hit and having a perfect first step. You are going to be shocked at how many balls you get to once you discipline yourself to get your feet in the sand and have perfect first steps even if they feel late. Here is a good rule of thumb. Choose a base defense (hopefully based on what you know about the opponents but thats not always possible) and stick to it. Focusing only on balanced defensive positioning and great starts. Without guessing or false stepping once, force the other team to beat you cleanly 3 times before you change any tactics. If you or your partner shank a ball, that doesn’t count as a win for the other team. If you false step, that doesn’t count as a win. They have to prove that they can comfortably beat you there before you even think about making adjustments but you should be self critical. If they beat you because you didn’t stay on task, re-focus and stick to the game plan. Olympian Brooke Sweat has the balance and the footwork to make her one of the best in the world. There are times for bait and switching. There are times for defensive juke moves. Just remember, these are tricks and while effective if performed with extremely precise vision and timing, they won’t have an impact without a solid defensive foundation based on balance, patience and great CORRECT first steps. Video yourself chasing some shots and watch your feet to see how many times out of 10 you take a first step in the direction of the shot. Finally, come to a camp or sign up for some lessons. 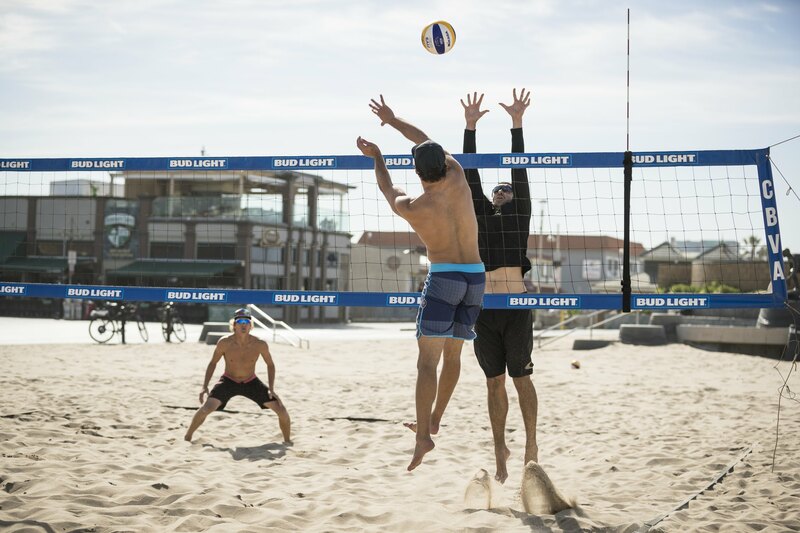 We created two new camps for the obsessed beach volleyball players out there. Our camps can net over 35 hours of training, instruction, film, weight lifting and live observation. Participants also get a full year of customized workouts from Super Human Performance. Our Juniors College Prep Fantasy Camps are the most exclusive opportunities for Junior players to spend a whole week living and training with current professional players, meeting Olympians and talking with college coaches. Take a look and book your spot for 2017. Check out this video featuring Taylor Crabb and John Mayer, two of the best defenders in the world.